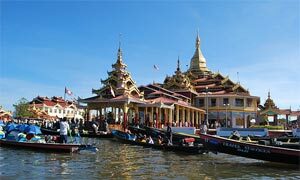 As Myanmar is known as the land of Pagoda and the most Buddhism flourishing country in South East Asia, the remains of many sacred sites, ancient cities, monumental religious edifices and architectural wonders are awaiting for pilgrims far and near around the globe. One can also taste or enjoy meditation guide by venerable monks to get spiritual peace of tranquality of mind away from anxiety or worries of life. Being centre of worship and pilgrimage today, you will always find new sources of amazement wherever you tour around Myanmar. The journey was not only a part of the "Buddhist Circuit" route inspection survey, but also an opportunity for the Thai private sector and travel writers to meet and exchange information with their counterparts in Myanmar. Fruitful results of Buddhist Circuit packages and other activities for tourism promotion and marketing are a step forward that Myanmar expected more tourist. 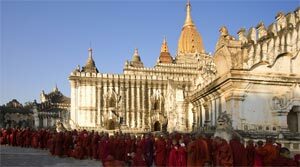 Myanmar predominantly a Buddhist country with more than 80 percent of the people embracing Hteravada Buddhism. Myanmar People have been built and donated their priceless religious monuments enshrining by Buddha’s sacred relics and other honorable saint and monks. This culture has been thrived since Buddhism kept and touched Myanmar by venerable monk Shin Arahan and Powerful King of Anawrahta (during AD 11 – 13). So that Myanmar is the one and the most unique place not only for culture exploration but also for paying homage to Buddha and his holy disciple. Today more than 90 percent of the people of Myanmar follow Theravada Buddhism and it is believed that there are more than 22000 Buddhist temples and viharas in the country. Some of the Pagodas (Dagab) of Myanmar are enormous structures as big as the Dagabas found in ancient Anuradhapura and Polonnaruwa. Though Myanmar, like many other Asian nations fell pray to western dominance, majority of its people are unspoilt by western influences. The World richest and most impressive Buddhist monument, the Shwe Dagon pagoda, more than 5000 ancient temples and stupas in 10th century Archaic logical Bagan , finest wooden architecture in Mandalay. Shwe Dagon is one of the wonders of the World as well as the valued religious center for Buddhist .It is strongly believed that the pagoda was built by enshrining the “8” strands of Buddhist hair. Maha Myat Muni pagoda from Mandalay is one of the famous and important Buddhist center as the Image was curved out of the powerful King of Sandar Suria and curved at the presence of Buddha and after curving it was given the warmth of Buddha’s bosoms in seven times. Other many of Pagodas Images are spreading the whole parts of Myanmar and each has their own true history and legends. We also provided Special programs of “Pilgrimages Tour” package and hope so that you will be satisfied to our Programs.